Wet cupping: too good to be true? Wet cupping is a therapy traditionally used in several cultures. It involves superficial injuries to the skin and subsequently the application of a vacuum cup over the injured site. This procedure would draw a small amount of blood into the cup, and this visible effect was taken as a sign that the humors or life forces or whatever are being restored. The treatment is obviously painful and carries the risk of infection. But does it work? There are not many clinical trials of this form of alternative medicine, and I was therefore thrilled to find a new paper with a randomised clinical trial. The aim of this clinical trial was to evaluate the effectiveness and safety of wet cupping therapy as the sole treatment for persistent nonspecific low back pain (PNSLBP). The investigators recruited 80 with PNSLBP lasting at least 3 months and randomly allocated them to an intervention group (n=40) or to a control group (n=40). The experimental group had 6 wet cupping sessions within 2 weeks, each of which were done at two bladder meridian (BL) acupuncture points. The control group had no such treatments. Acetaminophen was allowed as a rescue treatment in both groups. The Numeric Rating Scale (NRS), McGill Present Pain Intensity (PPI), and Oswestry Disability Questionnaire (ODQ) were used as outcome measures. Numbers of acetaminophen tablets taken were compared at 4 weeks from baseline. Adverse events were recorded. At the end of the intervention, statistically significant differences in all three outcome measures favouring the wet cupping group compared with the control group were seen. These improvements continued for another two weeks after the end of the intervention. Acetaminophen was used less in the wet cupping group, but this difference was not statistically significant. No adverse events were reported. 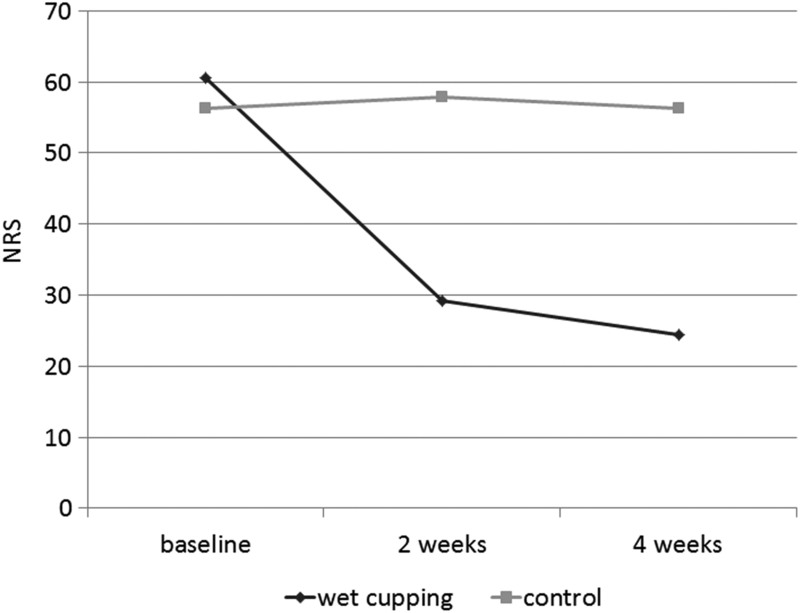 The authors concluded that wet cupping is potentially effective in reducing pain and improving disability associated with PNSLBP at least for 2 weeks after the end of the wet cupping period. Placebo-controlled trials are needed. Every now and then – well, actually in alternative medicine this is not so rare an event – I come across a study that ‘smells to high heaven’. This one certainly does; to be precise, it has the stench of TOO GOOD TO BE TRUE. Apart from the numerous weaknesses of the study design, there is the fact that the results are do simply not seem plausible. Low back pain has a natural history that is well-studied. We therefore know that the majority of cases do get better fairly quickly regardless of whether we treat them or not. In this study, the control group did not improve at all, as shown on the impressive graph below (the grey line depicts the symptoms in the control group and the black one those of the cupping group). To me, the improvement of the experimental group looks much like one might expect from the natural history of back pain. If this were true, the effect of wet cupping would by close to zero and the conclusion drawn by the authors of this trial would be false-positive. But why was there no improvement in the control group? I do not know the answer to this question. All I know is that it is this unexplained phenomenon which has created the impression of effectiveness of wet cupping. On a blog about alternative medicine, the issue of ‘pseudoscience’ can never be far. Several posts have already focussed specifically on this topic. Recently, I came across an excellent article on homeopathy (which is well worth reading in full). It concluded by listing the techniques commonly used in pseudoscience. Ignore settled issues in science: We know a great deal about the behavior of water (and evolution, and other contentious topics), but there are many efforts to introduce new science without ever addressing the existing body of knowledge. As such, many of the basic tenets of topics such as homeopathy appear to be ungrounded in reality as we understand it. Misapplication of real science: Quantum mechanics is an undeniably successful description of parts of the natural world, but the limitations of its applicability are widely recognized by the scientific community, if not the general public. Pseudoscientists such as homeopaths appear to cynically target this sort of ignorance by applying scientific principles to inappropriate topics. Claims of suppression: Pseudoscience is rejected because it does not conform to the standards held by the scientific community. That community is depicted as a dangerous hegemony that rejects new ideas in order to perpetuate a stifling orthodoxy. This happens in spite of many examples of radical ideas that have rapidly gained not only acceptance, but major prizes, when they were properly supported by scientific evidence. A conclusion/evidence gap: Many areas of pseudoscience do not set out to examine a phenomenon but rather have the stated goal of supporting a preordained conclusion. As such, they often engage in excessive logical leaps when the actual data is insufficient to support the desired conclusion. Focusing on the fringes: All areas of science have anomalous data and anecdotal findings that are inconsistent with the existing understanding. But those anomalies should not obscure the fact that the vast majority of current data does support the predominant theories. In the hands of a pseudoscientist, these unconnected edge cases are presented as a coherent body of knowledge that supports the replacement of existing understandings. Perhaps the clearest theme running through many areas of pseudoscience, however, is the attempt to make a whole that is far, far greater than the sum of its parts. Enlarging a collection of terminally-flawed trivia does not somehow strengthen its scientific significance. This is especially true when many of the components of the argument don’t form a coherent whole. For example, quantum entanglement, structured water, and silica are essentially unrelated explanations, and any support for one of them makes no difference to the others. Yet, somehow, presenting them all at once is supposed to make the case for water’s memory harder to dismiss.